The wind got up just in time for the Legends race which saw Scott Fenton, Barbara Kendall, Bruce Kendall, Tom Ashley race their own named Techno boards; joined by Sven Pederson and Georgia Schofield (current Techno sailors) respectfully on Aaron McIntosh and Santha Patel’s boards, beach start and sail along Takapuna Beach and back. To see these sailors able to jump on any board was certainly an eye opener for our young race sailors. The evening finished with a beach start race with all the young techno and RS: X sailors. It was a good chance to catch up with old friends, make new connections and welcome newcomers to windsurfing. Among those who came to support were Santha’s parents. They were excited to see the new faces of board sailing and had lots of stories to share. The Takapuna Boating Club is looking to start a Techno fleet in the New Year. 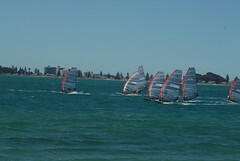 The whole RS:X and Techno race fleet from Tom Ashley down to the newest techno sailors headed to Tauranga to train for the two days leading up to the North Island Champs. It was great for the young board sailors to be rigging up alongside the likes of Tom, JP and Kate Ellingham. Not to mention their face when they saw JP head on out on his bike after finishing his training on the water. 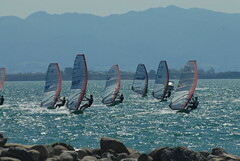 The buzz on the beach when the Techno sailors returned after coaching with Kate was encouraging to see. The Mount made a fantastic backdrop for the training. We all enjoyed the awesome hospitality from the Tauranga Yacht and Power Boat Club and the local community. We hope this event has generated more interest in board sailing in the Bay. This event was the inspiration of Stuart Pederson who is the spokesperson behind the Bay of Plenty Sailing Academy in Tauranga and the Bay of Plenty. The academy has also been promoting a "Learn to Windsurf" course at Kulim Park and 11 budding sailors aged 13 to 16 are about to graduate, with another after-school course set to be run in term one of next year.